Stackable washer and dryer sets are an increasingly popular option available to home owners. You can now vertically stack most front load washer and dryers rather than arranging them side-by-side. But what benefits can stacking offer? What do you need to create a stacked washer and dryer pair? Can any washing machine or dryer be stacked vertically? We’ll answer these questions and more in this helpful guide on stackable washers and dryers. There are two popular reasons why you might decide to go with a stacked washer and dryer layout. 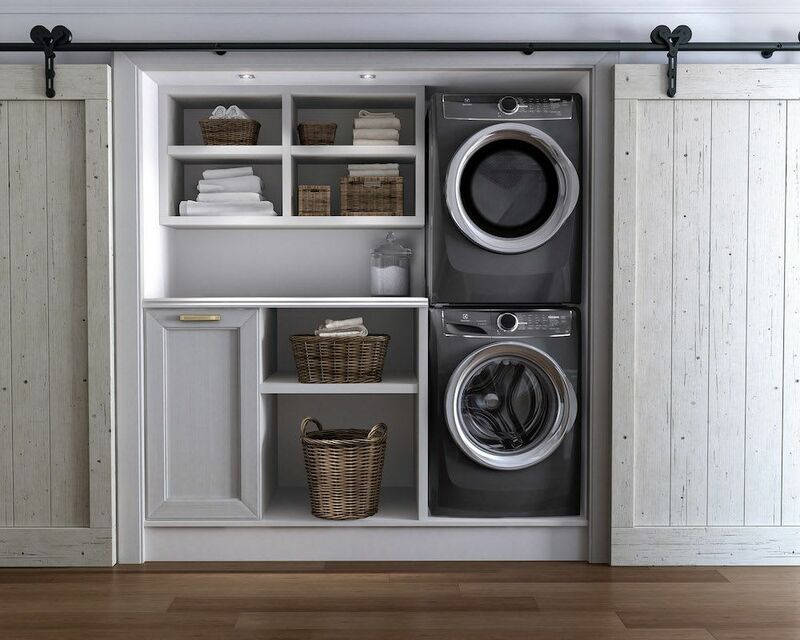 The first is that you have no other choice—many homes or rental units have their laundry sets located in small closets where vertical space is the only space available. But even those who have additional space are opting to go vertical because this set up affords for more functional floor space. Leaves more room for storage in a laundry room and has clutter-less appeal. Gone are the days when we were constricted to the builder-grade laundry centers that are immovable and space-hogging. As vertically stacked arrangements have become more popular, nearly all washers and dryers being manufactured are built to have stacking compatibility. Even the largest units which might seem un-stackable are being produced with vertical stacking capability as a key feature. How are laundry manufacturers able to do it? Over the last ten years or so, companies and researches have been focusing on ways to both minimize the vibrations caused by washers and dryers and safely deal with the vibrations that do occur. As a result, vertical stacking kits combined with washers and dryers that are made to be stacked are no longer a safety concern due to vibrations or any other potential risk. What Components Make Up a Stacked Washer and Dryer Setup? If you’re worried about vertical stacking being a complicated or costly process, set your fears to rest. The only parts involved are a front-loading dryer, front-loading washer, and a stacking kit. This kit, generally sold separately, secures the two machines together safely and solidly. You should never try to stack your washer and dryer without a stacking kit. Even minimal vibrations could cause them to shift, resulting in the top machine falling off and damaging itself, your home, and potentially you or a family member. It’s also important to remember that the washer always goes to the bottom in a stacked arrangement. The washer is much heavier than the dryer (particularly when filled with water) and provides a secure base, and it also tends to vibrate more than the dryer making the ground the safest place for it to be. Connections for stackable washer and dryer sets are the same as for traditional arrangements. You’ll need a 110V connection for the washer, plus a water intake and drain. The dryer will either use gas or a 220V electric connection. Some dryers offer a steam feature, though these units generally come with a Y-adapter that will allow them to share a water supply line with the washer. Selecting the perfect washer and dryer for your stacked setup will not only improve your laundry experience but can save you time, money, and significant headaches. We’ve put together this list of effective tips to keep in mind when you’re on the hunt for an effective stacked washer and dryer pair. Measure Your Space You may be surprised by how many consumers forget about this step, assuming every washer and dryer will fit their space just because the last set did. Get out the tape measure and find out how much room you’re working with, then compare those measurements when shopping for a washer and dryer. Don’t forget to measure space vertically as well, particularly if you’re going with a vertical arrangement. As for width, contemporary machines generally come in sizes of 24”, 27” or 29”. Don’t forget depth as well—modern machines are about 3”-4” deeper than older models. Check the Height Remember that you’ll have to reach any controls that are at the top of your dryer when it’s stacked atop the washer, so ensure that the dryer you choose has accessible function buttons that aren’t located along a back ridge of the dryer. This may make it hard to reach, especially if you’re on the shorter side. Know Your Dryer There are various types of dryers available based on how they’re powered and how they vent off heat. Gas dryers use gas to power their functions, while electrically powered dryers will use a 220V connection (with the exception of Miele heat pump dryers). Vented dryers connect via hose to a vent in your laundry space which leads outside, venting hot and moist air from the dryer into the outside air and away from your home. Ventless dryers use a condenser to get rid of excess moisture, and do not require a vent or connection hose. Ideally, you’ll want to go with a vented dryer because they’re easier to find and do a better job of drying your clothes quickly and effectively. Get Prepped No one likes to bring home new appliances only to find out they have to run to the hardware store for additional parts before they can get set up. Save yourself the trouble by purchasing all the parts you’ll need ahead of time. This could include intake hoses, a dryer ventkit, a 220V electric cord and a Y-adapter if you’re dryer has a steam function and needs access to a water pipeline. Don’t Forget the Hinges Take note of which direction your washer and dryer doors swing open. Some have reversible hinges to swing either direction based on the needs of your space, but others do not. Make sure that your space will allow you to actually open your washer and dryer doors and take clothes in or pull them out. Lose the Pedestals Some side-by-side laundry arrangements place the washer and dryer on pedestals in order to add storage space underneath. These simply aren’t practical to use in a stacked arrangement for one simple reason—you’re probably not seven feet tall. Placing your washer and dryer on a pedestal will raise the height of the dryer so high that just about any person would have difficulty reaching the top. You’re already saving yourself lots of space by stacking, so if you need additional storage you can utilize that space instead. Now that you know a bit about stacking your laundry, it’s time to unveil the superstars of the field. We made two lists to cover the best laundry considering the differences (both in terms of performance and use-case) between the full-size and compact units. Full size laundry picks feature 27" width units with Vented dryers. Dryers come either as electric (220V) powered or gas. This is the entry model for LG. Low price point and excellent overall reliability makes it a great pick. The dryer does not have the steam feature. 1,300 RPM Powerful motor to extra maximum moisture to save you time. Stackable washer pairs with a steam dryer. This Electrolux pair is our top pick for a full-size stackable solution based on its extensive feature set, perfect compatibility and modern-minimalist aesthetic. The washer is a 27” front-loading beauty with a steam function that also boasts 9 wash cycles, a 4.3 cubic foot capacity and a max speed of 1300 RPM. The dryer offers an instant refresh cycle, 18-minute fast dry cycle, perfect steam function and a sanitize option. Electrolux is the only manufacturer that was able to fit this large drum in 32" depth chassis, which makes it ideal for most closets. 24 inch Washer stackable with ventless electric dryer with Steam (WxHxD 24in X 33 1/2in X 25in each unit). Stainless steel color option - EFLS210TIS. For those looking to find a budget solution to their vertical washing and drying needs, this pair from Bosch offers powerful features in a compact and budget-friendly package. This includes a 24” front-load apartment sized washer that allows for up to 15 lbs of load and features a sanitizing cycle for killing bacteria. The dryer is a condensation drying product without an external duct, an option that might appeal to apartment-dwellers who might not have a venting hookup in their unit. This compact Miele W1 T1 washer and dryer set is a powerhouse. It offers 25 specialized wash settings and Miele’s patented Honeycomb Drum designed to be gentle on even the most delicate clothing and fabric. The large control screen makes setting your cycle a snap. You will love the TwinDos dispenser which allows you to forget about adding a detergent for up to 3 months. In addition, the Miele W1 WWH860WCS washer is the only residential product in the market with a whopping 1600 RPM spinning motor. This feature makes it possible for you to get rid of excess water right in the washing machine which leaves less work for the dryer to do (i.e. shortens dryer cycle time). Miele also offers the most shallow depth laundry set at approximately 25" which allows these machines fit even in tightest closets. As for the dryer, Miele T1 heat pump dryers are the only 120V ventless models in the market. Heat pump technology is fast, supremely energy efficient and gentle on your clothes. If you are replacing an old 220V model, Miele even offers a NEMA adapter so you save on the electrican bills. The Miele T1 TWi180WP model features steam cycle to help sanitize clothes. I would like to learn more about Samsung Stackable Washer and Dryers. Do you have additional information? You are right. Samsung washer dryers are very popular. Although recent tariff wars handicapped Korean manufacturers with inventory we love Samsung products. There is a large selection pool based on your laundry needs with this brand. We prepared the following guide to help you find the right stackable Samsung washer for your budget. Do you have more information on LG Stackable Washer and Dryers? LG has innovative products in laundry category. Apart from cleaning excellence, fit, form and finish are superior in the catalog of super silent LG washers and dryers. Here is the link that goes beyond manufacturers' lingo and clearly explains choices within the LG family to help you select the right laundry. How do LG vs. Samsung laundry compare? We get this question a lot. Therefore, we prepare an indepth review comparing LG vs Samsung washer and dryers. I cannot find much information on Miele washer and dryers. Can you help? Yes. We have an indepth review article on Miele W1/T1 compact washer and dryer. You will also notice our excellent video review in this article which includes amazing visuals. This is a must-read/watch article before you purchase this laundry set. What are the difference between Bosch 300, 500 and 800 series washer and dryers? We covered the differences between Bosch 300 vs 500 vs 800 series in our earlier review.